In my pursuit to gain further self-sufficiency, I have been wanting to raise a couple pigs. I’d heard they were pretty easy and in usual fashion, I read about every book known to man on the subject. I choose what breed I thought would be best, lean flavorful meat (Berkshires). 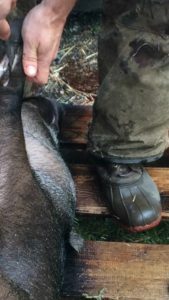 So much of what I had seen on the internet seemed to be well versed hunters/farmers who would shoot the pig with a large(er) bore round (.223, 30-30, etc.) and/or then stick the pig with a large knife. It seemed pretty traumatic for the pig and the farmer; lots of squealing and a less than quick death. After watching all of these videos and reading various articles on the subject, I kept coming back to Brandons method. He constantly uses only a .22 magnum load, hollow point placed in just the right spot. The result? no fuss, lights out, just like a switch….. I liked that! 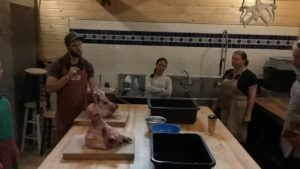 I had an amazing few days with Brandon and Lauren Sheard of Farmstead Meatsmith (www.farmsteadmeatsmith.com) in Vashon Island, Washington state. Brandon and Lauren have had this business since 2010. Brandon’s expertise is that of a personal abattoir, butcher, and all things charcuterie. He is very focused on the traditional methods of slaughter, that is to say methods which impacts the animal as little as possible and promote the general health and welfare of small farms maximizing each and every piece of an animal which is taken. I came away at the end of my three days amazed at the simple but thorough process which was carefully designed by Brandon and Lauren. I was grateful at the care they had for each animal which was slaughtered and the passion they have for passing on knowledge which has largely been lost to industrial food production. My trip to Washington began several years prior to my departure from San Jose International airport. A number of years back I purchased approximately 13 acres in the hills outside of Santa Cruz California with a great desire to grow much of my own food, Source most of my own meat and pass along to my children the amazing feeling of true self sufficiency. I’m not sure how I found Brandon and Lauren. Though many years ago I became acquainted with their website, in the methods they used for slaughter, butchery, and charcuterie. I watched about every YouTube video there was on his service. For years, I watched the dates of the various classes come and go. And each time they passed I felt an ever increasing desire to attend one of the three day courses. I had been watching their site for a new class opening and in March, An opportunity presented itself to attend a three day course in early July. I left Oakland international airport early on a Tuesday morning with an arrival time in Seattle at approximately 9 AM, I found my rental car, collected my bags and decided that I would tour Vashon Island. I had never been on a fairy before and the ride was amazing to me. Just the ability to be able to drive onto a boat, How’s that boat shuttle you across an inlet, and disembark hey your desired location with your car and all of your items to me is amazing. Once I hit the Vashon Island ,I was amazed to find a very vibrant community. It is full of artists, farmers, restaurants and various sorts of people who enjoy certainly the more eclectic, thought-provoking, interesting things in life. I found the people to be very engaging, very sweet and very hospitable to outsiders. I love the various restaurants that I dined at, and felt a renewed energy there that I hadn’t felt in sometime. The air is thick, it is so easy to breathe, and the island is surrounded by wildlife. I encourage anybody who is reading this to take a trip to Vashon Island and while there, schedule things for you to do; particular to this island. We were told the location of our host farm via email several days before our arrival. As I was driving toward this farm and pulling into the drive that lead to the main farmhouse, the area around it was simply breathtaking. Everything was so green and lush, you could tell that the soil was healthy, And the animals that were around the farm we’re healthy, happy and well taken care of. I met the owner of the Farm who has an amazing background in the culinary arts himself a chef and now Farmer aspires through non-profits to recapture land for purposes of small farming. His name also was Brandon and I was amazed at the small homestead that he had put together along with his farmhouse which struck me as very similar to mine. I hit it off with Brandon, The owner of the Farm almost immediately. He was a no nonsense kind of person with obvious skill and lots of different arenas. He told me all about his farm and how he was raising his pigs, what he had been feeding them and the reasons he had chosen a cross of Mulefoot and American Guinea Hogs as his primary pig. He went on to tell me about the Culinary values of the fat within the pig and how he did not understand the desire to have a lean meat pig. Branden Sheard, was setting up for the day. He had a very large 55 gallon drum filled with water sitting on top of a very large propane burner. Above that was a small boom attached to his box van which operated by electric winch and would be obviously used to raise and lower the pig into scalding water following the slaughter. There were approximately 6 or 8 pigs in total into were selected by the owner of the farm to be slaughtered that day. As we walked up to the area where the pigs were held, Brandon, the abattoir, began speaking to us about the method he uses to slaughter pigs. Brandon has an obvious warm heart for the animals of the farm and definitely has a high respect for the sacrifice that they will give. 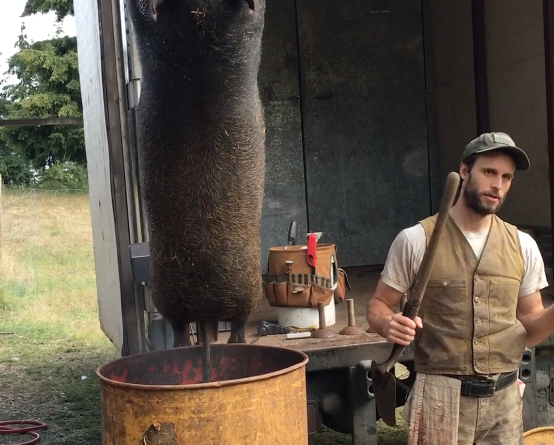 He told us how important it was that the pigs not suffer during a slaughter, he recounted to us the efforts of others to use large bore rifles or other means by a knife which caused undue stress and did not complete the job as quickly as he felt was right. Brandon explained to us, that if you drew a line between a pig’s eyes, right in the very center of that line, draw a line straight up about 2-1/2 to 3 inches, That is the exact point where you can shoot a pig with a small caliber .22 rifle (He uses magnum load, jacketed hollow points), and end the pigs life rapidly; without any undue stress. Brandon reiterated that the trick to completing this task quickly for the animal’s sake and for your own was, to take your time. 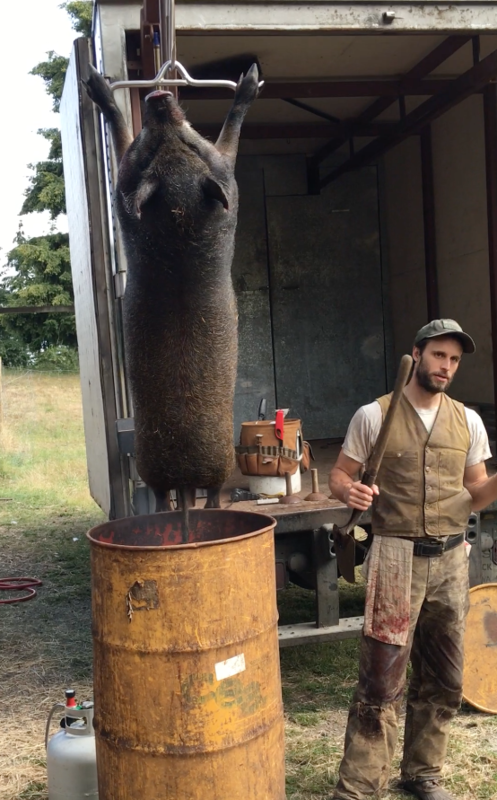 I would say, it took Brandon four or five minutes with the pig very close to the end of his muzzle before he found the exact right time to take a shot. What I was amazed at was that when he decided to take that shot, the pig just stopped. There was no fussing, squealing or any other cues which would lead somebody to believe the pig had suffered. It was over really before it even began. 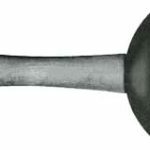 In order to illustrate, Branden would even put the blood to use, making blood sausage. 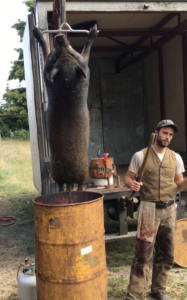 Immediately following the shot, Branden jumped over the fence and made an incision in the neck of the pig, in an attempt to gather as much blood as he could. He had one of my classmates jump over with him, gather the blood in a bowl and stir it with a wooden spoon as Branden had told us that the coagulant would naturally collect on the spoon, making the blood, possible to use. 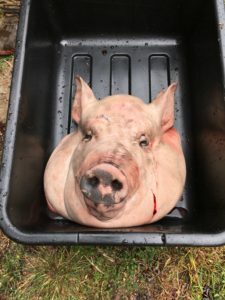 Once the slaughter had taken place and the blood collected, the pig was taken by wheelbarrow Down to the prep area where Brandon had placed his 55 gallon drum. There was a pallet sitting to one side where the pig was placed and washed clean. I had never been involved in a pig slaughter before and I have to admit that I was rather pensive about the experience. I had been raised in a family who hunted ducks on occasion though all of our meat had come from the store. I was not accustomed to killing anything for my own sustenance. What I was grateful for was the amount of respect that was given to this animal by Brandon and those who were attending the class. As the pig was washed it was done so very carefully and I remember several other class members telling the pig, thank you. Hanging by the tendons in the front (For the scald). (Videos below) Once the pig was clean, he was hoisted up buy two tendons near the hooves and dunked in the water which was approximately 145°F. This scalding is meant to loosen the hair, which coats most pigs. Brandon demonstrated to us how he would remove the pig from the water every 90 seconds to check how easy it was to remove the hair (see vid eo). 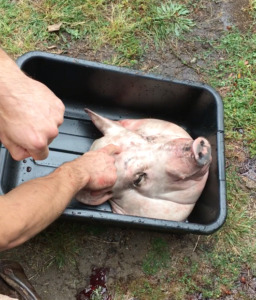 He reinforced to us, that you had to wait long enough in the water so that the hair came off easy but be careful that you not leave the pig in there too long as, there is a tipping point and past this, it becomes increasingly difficult to remove the hair. Because of the size of the pigs, only one half at a time could be scalded. 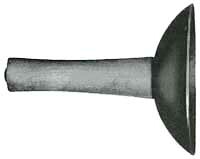 it had been determined the hair was coming off easily, bell hog scrapers where used to remove the hair (pictured below). If you know how to make good stock, you’ll be fine making head cheese. Simmer for hours, skimming the foam that rises to the top. Strain it, separating the meat and vegetables from the cooking liquid. While its reducing, pull all meat from the hog head and any bits (if your adventurous, eyes, ears, pallet, tongue). Cleaned and all ready for the jowl meat or heat cheese. The process from there was a very quick. The hog was hoisted up, head removed (for head cheese), hand cut in half long ways (down the middle of the spine, pictured and video), and put in the forward area of Brandon’s van, which had a built-in cooler. The process was repeated for a second hog. Following the second one, the liver and the heart of each animal was collected, taken to the farmhouse, diced up and made into a stew. 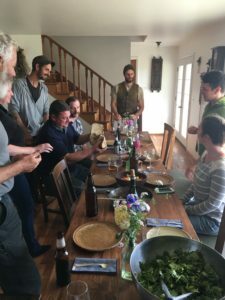 Branden’s wife, Lauren made fresh sourdough bread and we ate around a very old farm table in the middle of an amazing farm and I know each person there was truly giving thanks. For several of us, It was our first time eating pig liver and heart. I had made a commitment to myself about this class I was attending. I had a strong desire to raise my own animals at my own farm so that I might be able to know where my food had been sourced. It has become increasingly important to me to know what was fed to each animal I eat as well as knowing there was respect for the animal, which was feeding me. It has been a great desire of mine to pass this knowledge to my children so they may grow big and strong with food in them that’s healthy and has not been tainted by industrial methods or efforts to achieve the highest yield possible, sacrificing quality and sustainability. I had also determined for myself and knew as a result of having watched many of the videos of Branden doing his work that I would be exposed to eating parts of a pig which I had never eaten before. I knew that I would be challenged to be thrifty with each and every component of any hog I raised, slaughtered and butchered myself. This tenant seemed to be the theme of the day. Little did I know it would be the theme of the whole week. Day two started bright and early at Brandon’s farm. He has an amazing set up for butchering, curing and charcuterie (I have taken panoramic pictures of his small butchery). We began the day by cutting up the lard from the two hogs into small cubes. These cubes were to be rendered down into the pig lard which can be used in so many applications ( I have pictures and video of this below). From there, we were able to take apart each pig and butcher it into the cuts that the former, Brandon wanted. I have to say, I was amazed at the desire to give cuts in a way that maintained both the lard, flavor and texture of a well raised hog. I encouraged you to watch the videos below which will guide you through the various intricacies of the butchery process.